Unbelievably powerful and expertly agile, the tiger (Panthera tigris) is the largest member of the cat family and the focus of tonight’s final episode of Dynasties. They occupy a vast but fragmented range from the dense jungles of Indonesia all the way up to the snowy expanses of Siberia – demonstrating their excellent adaptability in a plethora of different habitats and ecosystems. The largest individuals are found in Siberia, where the males can reach up to 300kg, yet still possess the power to jump as high as 10 metres – over five times the height of an average person. Tigers are magnificent hunters, consuming a diet of mainly hoofed animals such as Sambar deer, wild boar and water buffalo, although this diet will vary considerably depending on their habitat. The most striking feature of the tiger is their fiery orange coat marked with charcoal-black stripes. This beautiful fur pattern provides superb camouflage in the autumnal-toned vegetation. Their tail, which is also striped, helps tigers maintain balance when chasing after prey or climbing rocky tracts. 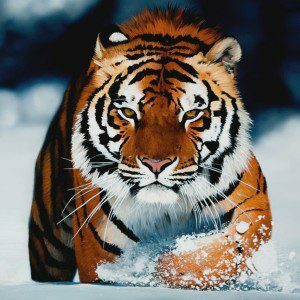 The tiger is the national animal of Bangladesh, India, Malaysia, Myanmar, South Korea and Vietnam, but these mammals are not being given the respect they deserve. Fewer than 4,000 tigers remain in the wild, spread out over six subspecies, with the South China tiger being most at threat (most likely extinct in the wild). Nine subspecies of tiger used to roam our planet, but within the past century, the Javan, Caspian and Bali tiger have all become extinct – forever gone because of human’s actions. Tigers occupy a range of habitats from swamps to forests to snowy plains. It is estimated that wild tiger numbers have dropped by an abhorrent 95% since the beginning of the 20th century and now all six extant subspecies are considered either endangered (the Bengal, Siberian and Indo-Chinese tigers) or critically endangered (the Malayan, South China and Sumatran tigers). The cause of their suffering is due to human conflict; habitat loss and fragmentation; and poaching. Unfortunately, tigers live in some of the most densely populated places on earth so conflict with humans is almost inevitable in our ever-increasing crowded world. Tiger parts are also used in the fruitless and detrimental practice of traditional Chinese medicine. A mother and her cubs enjoying a leisurely swim. Thankfully, conservation organisations such as the World Wildlife Fund (WWF) and Wildlife Conservation Society (WCS) are working closely with governments to resolve human-tiger conflicts and establish larger national parks where these tigers can hopefully live in relative peace – tigers are extremely territorial are require up to 450 kilometres squared each, so large habitats are essential. However, tigers are far from safe and their conflict with humans will only worsen unless drastic action is immediately taken. These majestic cats play such a vital ecological and cultural role in Asia that their extinction would be shamefully inexcusable.